It’s easy to be inspired in the kitchen to make something, and I’m not just referring to food either (okay, maybe I am just a little.) Items for use in the kitchen are popular projects, not only with our spouses but often with family and friends. 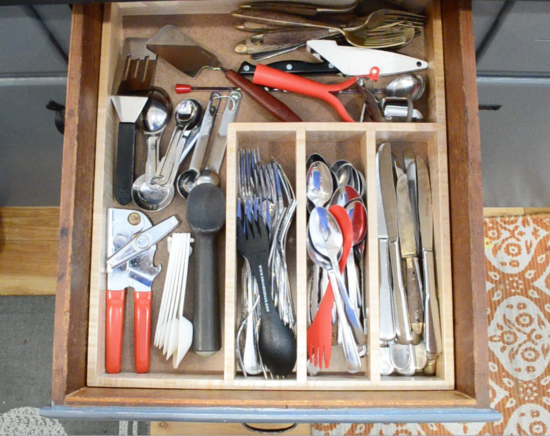 My wife Samantha has a long list of things she’d like built to help her keep things organized in the kitchen, and at the top of her list is to get rid of the hideous plastic utensil organizer we’ve had since we first moved in together 18 years ago. Old, plastic and has got to go! 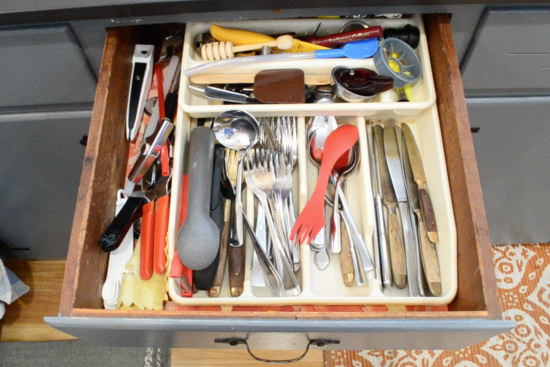 So on today’s episode we’re building a custom utensil organizer for our kitchen cabinet drawer. One that not only holds the crazy number of forks, spoons and knives we own (I have no idea how we’ve accumulated so many) but also all of the extra things that I couldn’t tell you exactly what they do. This is a custom-sized project, so I won’t share a plan for it, but after watching I’m certain you’ll be able to build something very similar for your kitchen drawers if you were interested. It all comes together using two of the most basic joints in the woodshop, the Rabbet and Dado, and given the number we use, you should become quite proficient in setting them up and getting great results on your next project. A huge thanks to the folks at Bell Forest Lumber for providing the beautiful tiger-maple for the project from a donation to the show several years ago. If you haven’t checked them out previously for lumber, you should definitely take a look, I have yet to not like anything I’ve received from them. Great project and it’s really nice to see you posting projects again. Looks like a new bench, too. Just wanted to also say great to you’re posting again. You’re looking good. Keep up the good work! Nice project! I have been thinking of kitchen organization in general. I need to do something with the cabinet that holds all of the cookie trays, cutting boards, etc…what glue did you use for the hard board. You glued right to the shiny side right? Just clamps? Miss you on wood talk…it is just not the same without you….maybe make a guest appearance on it or something….Some of Marc’s jokes go flat without you there to finish them off…I still listen and like those guys but do miss your personality on the show. « 557 The New Workbench is Here!